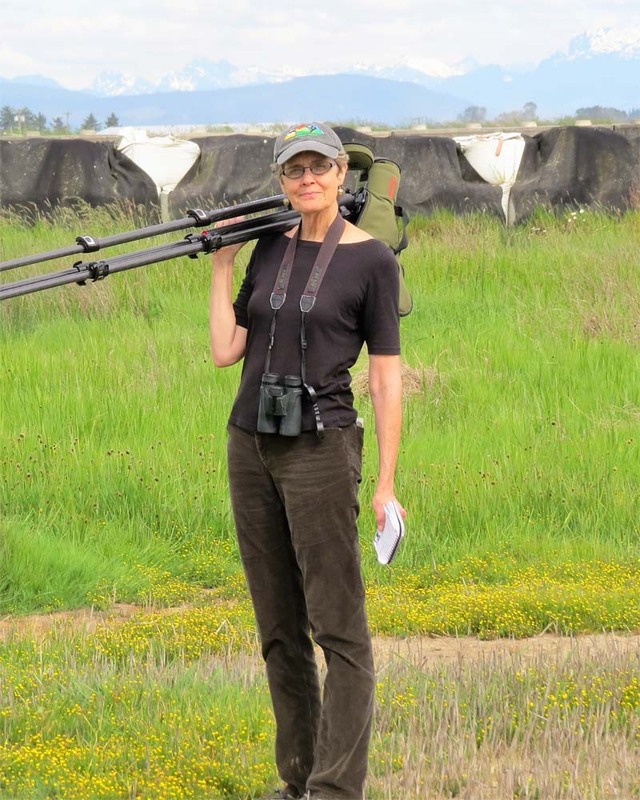 Luckily, the open season on shooting upland birds and water birds and all mammals and anything else you want to shoot, including stop signs, with a camera appears to have been extended through the spring 2017 in Washington state. 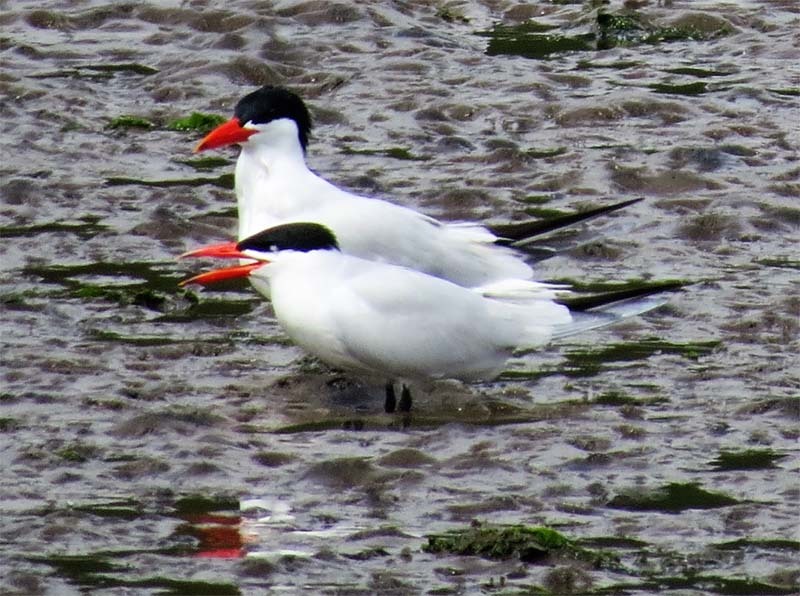 Here is a Caspian Tern couple in Nisqually. Not a great shot technically, but it demonstrates why I think this is one of the most underrated glamour birds we have. Even more gorgeous in flight. 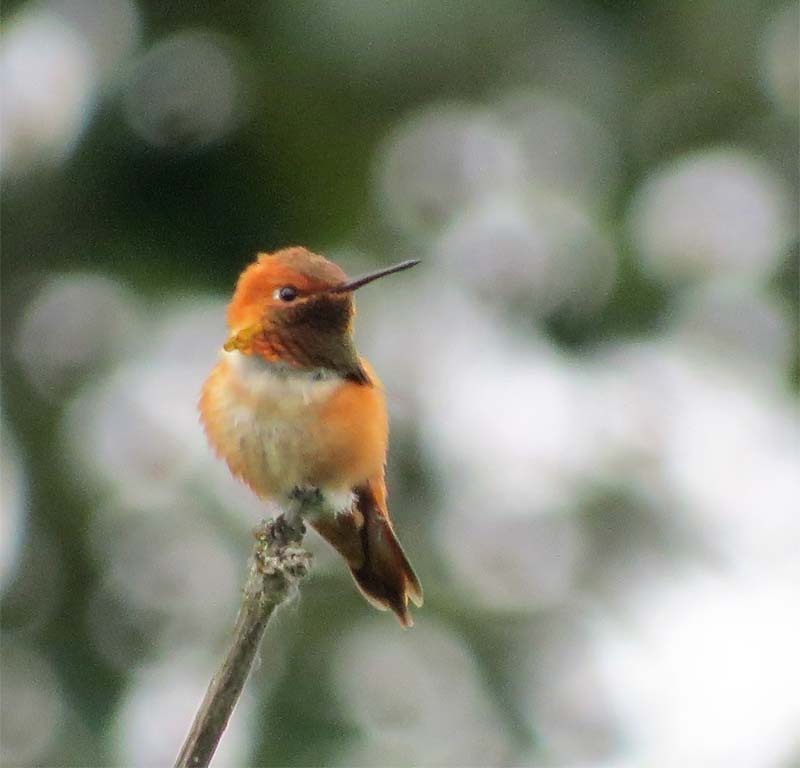 This male Rufous Hummingbird was at Marymoor Park. And this female was in our yard. She’s using our recirculating creek, Butyl Creek, for bath-time, but she has a new technique, which I didn’t really get a shot of, to get right in the main stream of Butyl Falls and just clamp on and let the falls wash over her for a minute or so. It looks like she’s dead and somebody nailed her there. I was late getting the shot, in this picture she’s getting finished with her bath and ready to fly away. I don’t think I’ve ever seen it before. Another technically-terrible shot but sometimes bad shots can still highlight the bird’s essence pretty well. This is a Lazuli Bunting from last weekend at Marymoor Park. 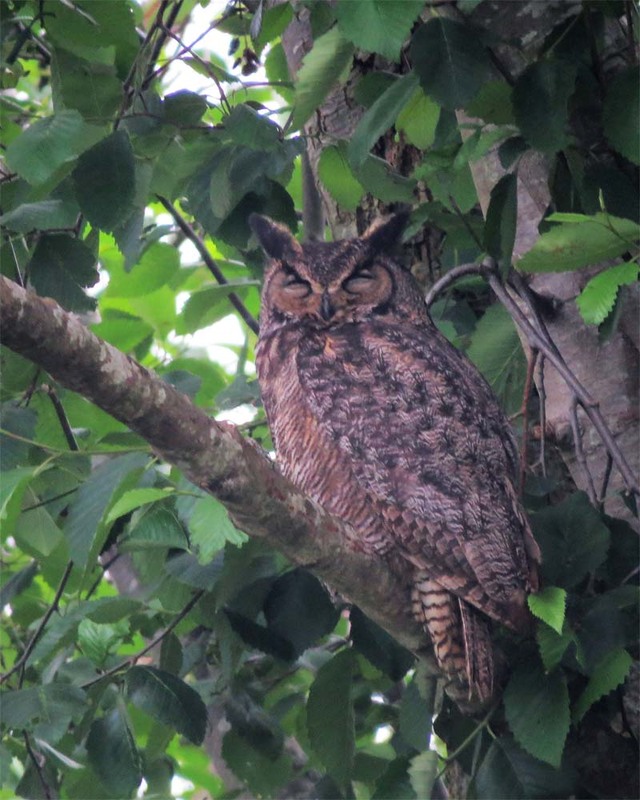 This is a Great Horned Owl that was with its mate and two babies at Wylie Slough, in the Skagit delta by Conway. 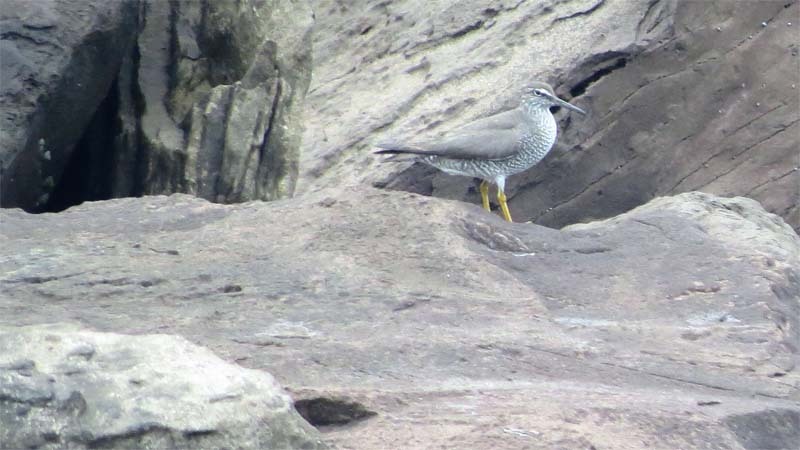 This Wandering Tattler was at Westport. If this bird looks strong it’s because it is. I was out in the ocean off Westport once when one of these came flying up following the boat’s wake and then whizzed right over our heads—probably curious but no way thinking about slowing down. They fly to places like Hawaii and the Aleutians. 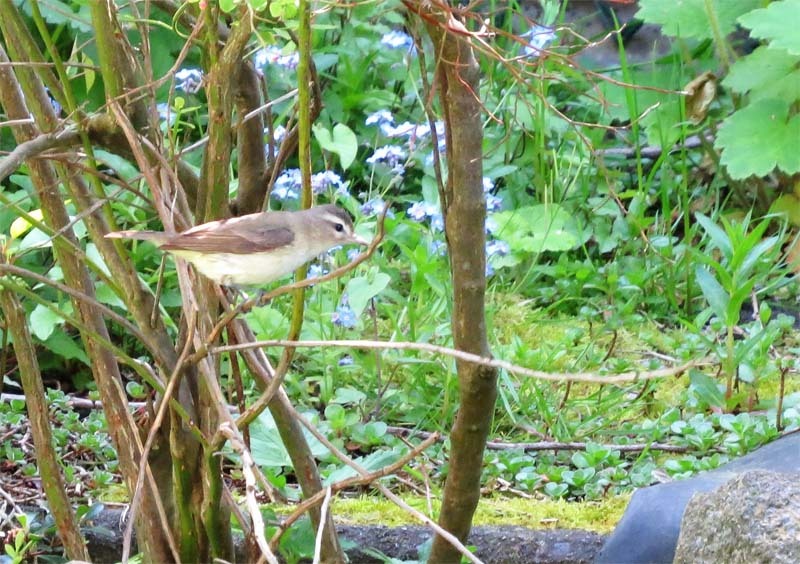 During the migration this Warbling Vireo came down to check out Butyl Creek, our recirculating creek. 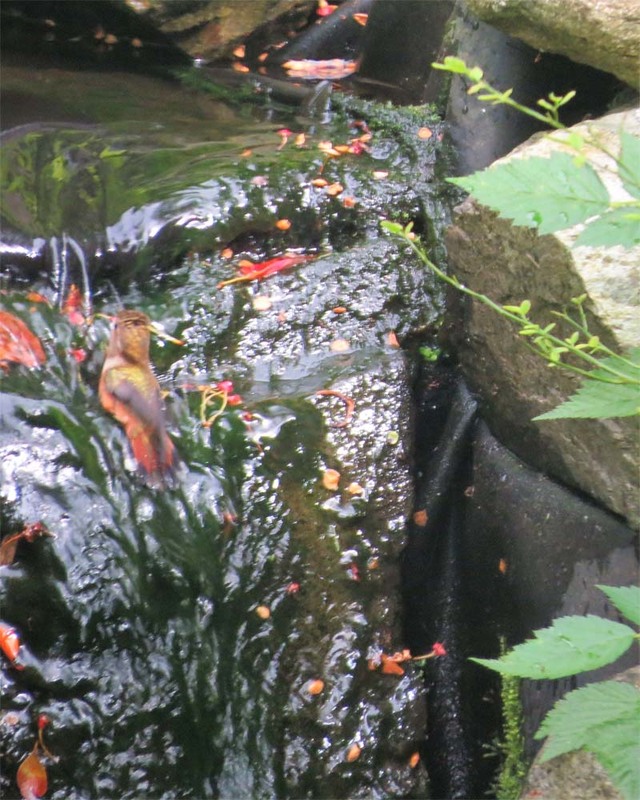 Oddly, a Willow Flycatcher showed up today to take a bath, I would have thought this is late. 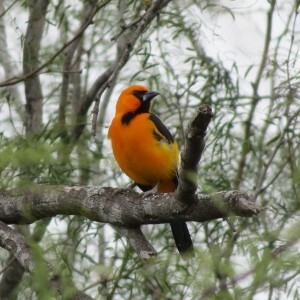 Delia also heard a Western Wood-pewee and we were happy to see our first Rufous Hummingbirds, a male and a female took a bath. Delia is in the long drawn-out process of retiring, and is home on some weekdays now. Having her eyes on the creek in addition to mine is a huge help. Here Delia is carrying the scope at Eide Road near Stanwood. We went up to Newhalem in the Skagit River valley last Sunday and found American Redstarts and Red-eyed Vireos. 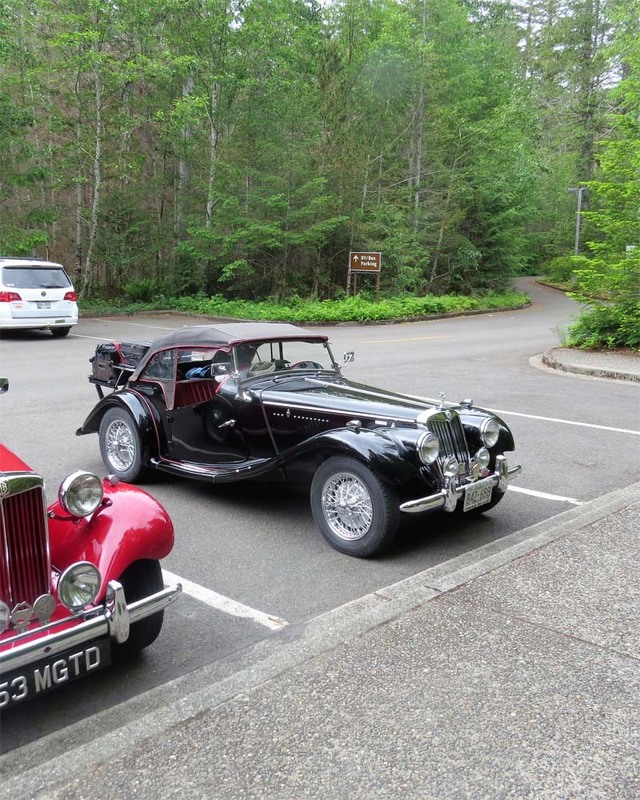 This MG TF, traveling with two TDs and some Brits was easier to photograph, however. We stopped at the delightful Cascadian Farms roadside stand downstream of Newhalem and got fresh raspberry shakes and watched four species of Swallows fly around from their deck. 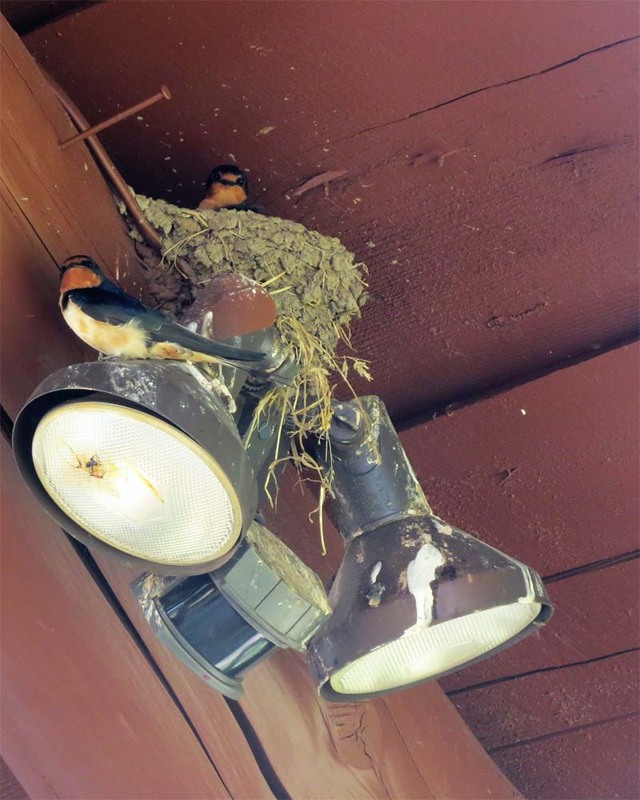 These Barn Swallows, which appear to be becoming extirpated in Seattle, were nesting there. Barn Swallows are as cool as it gets. We called I-5 “Kingbird Highway” on June 24, when we used it to get to Spencer island, just to the east of Everett. 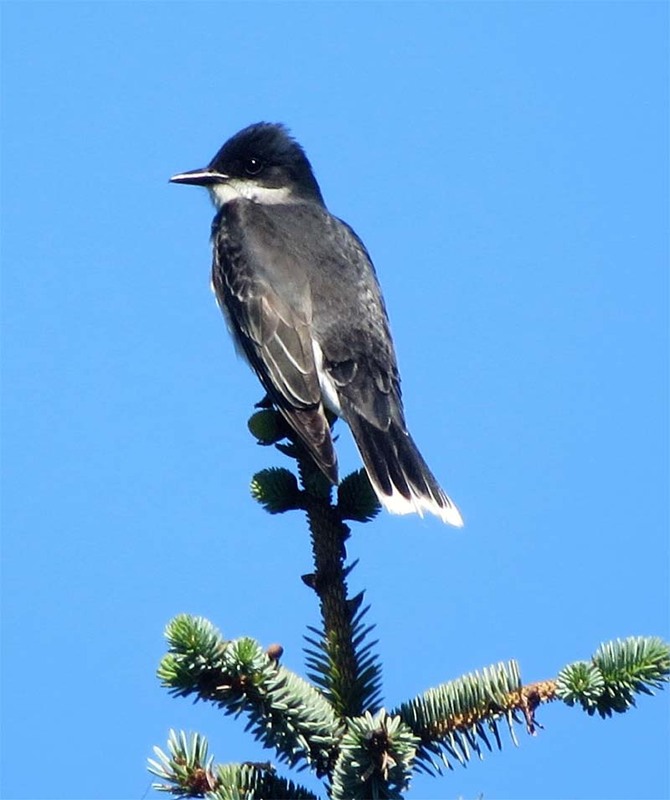 This Eastern Kingbird was looking fabulous on the trail north on the Spencer side. Bring a small pair of hand-clippers if you go, although they aren’t necessary. 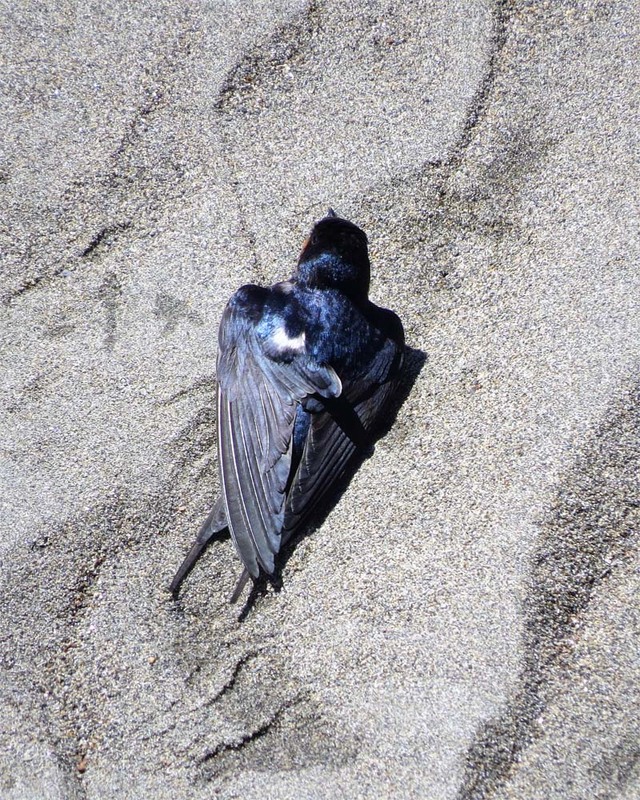 No, don’t pity this bird, it’s sunbathing on a beach on Spencer Island. It was all the rage among the Barn Swallows that live under the second bridge going south.. 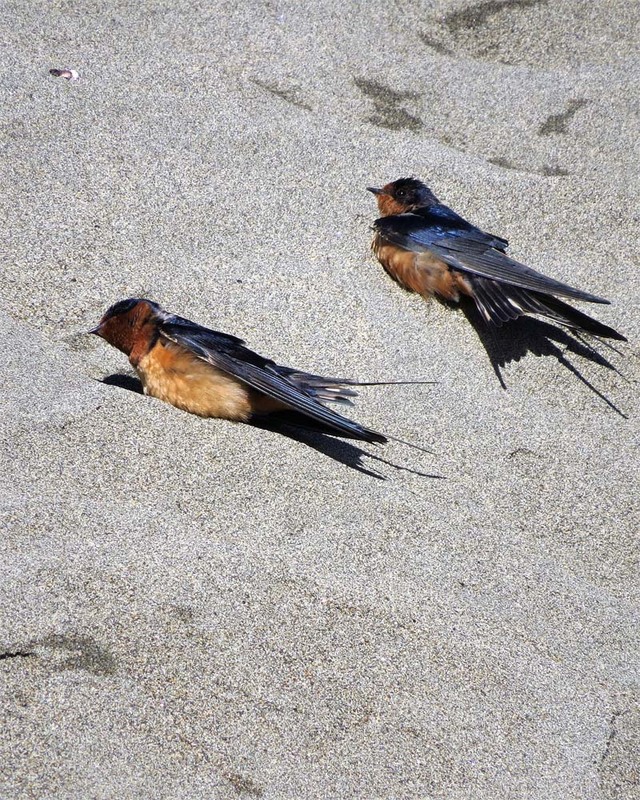 Here are two more sunbathing Barn Swallows from Spencer Island, June 24, 2017. 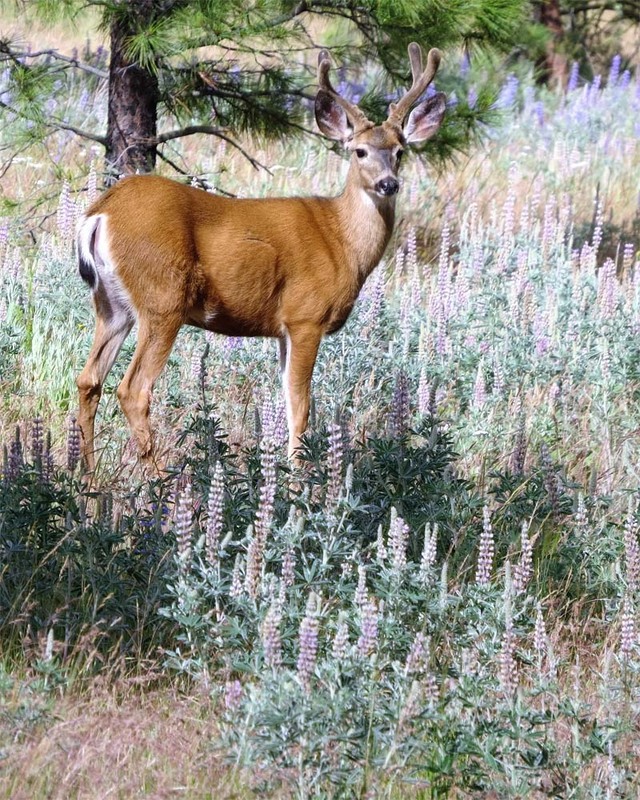 And here’s a shot of a Mule Deer buck out by Wenas Creek on the Eastern Slope, posing in lupine.